the stone is 19'' high and 13'' by 10''. Stone with carving. It is dated to the early eleventh century, but this date is uncertain (no. 23 at Bakewell). 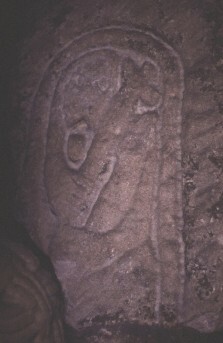 The stone has a cross-bearing figure within a segmental-headed panel. The body and arms of a man holding up a cross-topped shaft are all that remain. The cross and three fingers of the man are most distinct.